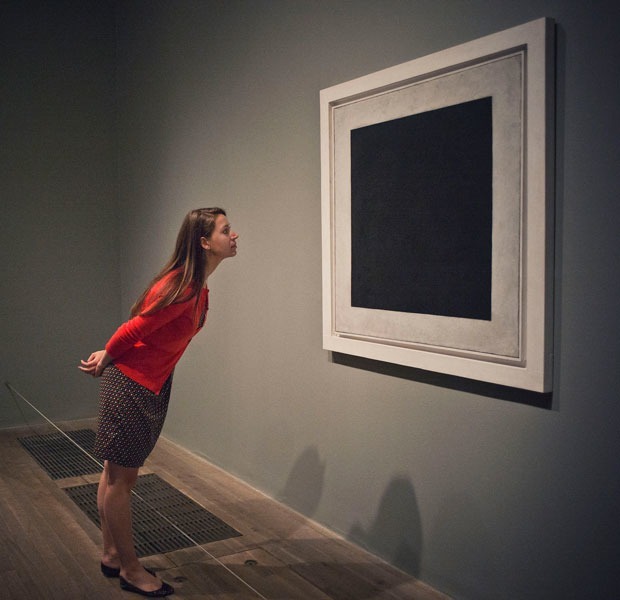 A team of art historians and researchers from Moscow's Tretyakov Gallery have found handwriting in Kazimir Malevich’s Black Square. And it’s not good. They speculate the passage is probably a reference to a monochrome painting by Alphonse Allais, a French writer, humorist and cartoonist popular in Russia at the time Malevich made the work. In 1882, Allais’ “Battle of negroes in a deep dark cave at night” was considered a joke. Racist trolling or trolling racists? Malevich layering black paint over the Allais quote could be interpreted as the young upstart trolling the older man, and his racist painting, and the artist community in general. Allais also made a “white” version: “First Communion of Anaemic Young Girls in The Snow,” from 1883. The racist one can be found on his rather extensive Russian Wikipedia page, which also claims Allais beat Malevich by thirty years in creating “early abstract paintings.” The shorter English Wikipedia entry omits the piece in question. So far, the experts have not been able to decipher with total certainty the word they think says “negroes.” This is due to the idiosyncrasies of Malevich’s handwriting style, mainly the fact that his cyrillic letters “n,” “p” and “i” look very similar when written, reports Meduza, a news publication based out of Riga. Still, they think the Allais link provides a solid lead. With the help of macroradiography, the experts also discovered that the painting has two layers of underpaint, not one as previously thought. Malevich, the godfather of Suprematism, painted what is widely seen as his conceptual masterpiece in 1915. It was exhibited that same year at a watershed show of Futurist paintings, in the upper corner of the room, signifying its role as a modern-day icon. Now, 100 years later, it’s hardly surprising that so many renowned cultural figures are being outed as bigots. Or trolls.